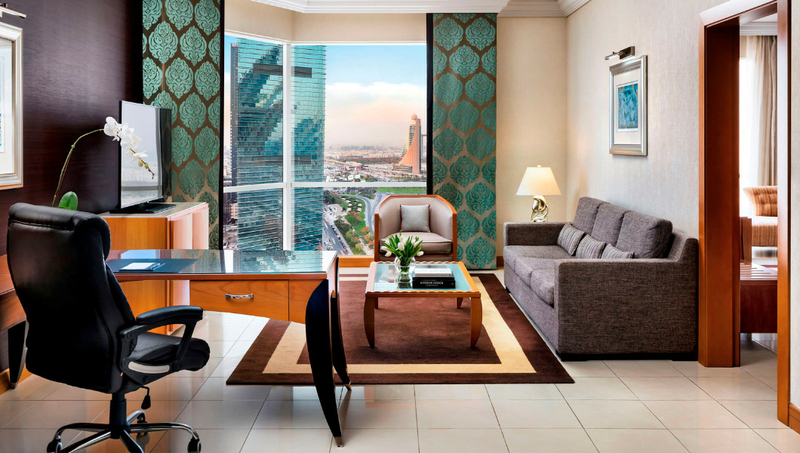 Towering above an eight-lane superhighway in the emirate’s bustling financial hub, Fairmont Dubai is a veteran property by local standards, and the first international property for Fairmont Hotels & Resorts when it opened in 2002. The 34-storey tower reaches the ripe old age of 16 this month, and has seen scores of new players enter the hospitality game during its tenure, but the old steed retains its pedigree as one of Dubai’s foremost luxury properties. In a city that’s grown exceedingly rapidly, with new hotels arriving every month, it’s challenging to stay at the top, but this property continues to live up to its renowned badge as a thorough and complete city hotel. Between the contemporary spa-esque lobby and the distinctive four-pronged rooftop, the property has a cool, refined air. I have everything I need under that tiara-shaped roof, which is a reasonably unfair comparison since the building’s aesthetic is in fact modelled after an Arabic wind tower, known as a barajeel. It’s a subtle nod to the heritage of the UAE, and a fitting segue to announce that check-in is an absolute breeze – Fairmont Gold guests can check in from the main lobby, or glide up to the 33rd floor for the VIP check-in experience. Rather than yo-yo back and forth, I get the deed done on the ground and shimmy straight to my Fairmont Gold One Bedroom Suite on the 17th. The 83sqm room is one of 146 suites and luxury penthouses, not to mention the building’s scores of residential apartments, all of which offer a range of views, from the relentless city streets below, to the more serene suburban neighbourhoods between the hotel and the coastline. The door opens up to a polished granite floor, which spans the business area of the suite and the lounge-dining room combo. The living area stretches out as a rectangle from the entrance to the floor-to-ceiling windows, which allow light to flood in from the south and give a commanding view of the distinctive Emirates Towers. On my right is the desk, which I didn’t intend to use, and a little bar area with lots of complimentary Nespresso paraphernalia, which I did. The entire room is a medley of soft, earthy tones; contrasting pine and mahogany woodwork, a plush brown rug, two cosy bucket chairs and a charcoal-coloured sofa where you can kick back in front the widescreen TV. It’s an ideal venue for hosting colleagues or friends, with ample lounge seating and a four-seater dining table where you can feast on the in-room dining menu. There’s a guest bathroom nestled by the door, but the master of the suite may grant access to the en-suite bathroom, stocked with everything you’d expect from a five-star stay – as well as some surprising amenities.A rose by any other name would smell as sweet, but it took a lathery double take in the shower before I clocked that my bottles of Rose 31 body wash, shampoo and conditioner from New York brand Le Labo bore my full name on the packaging. The King-size bed was comfy, with soft cotton sheets and a mattress you could lose a whole day in. The bedroom alone accounts for more than half the size of the suite, complete with a huge amount of wardrobe space, a luggage rack, dresser and yet another large TV. It’s a haven from the outside world, perhaps only lacking in a balcony area, which would really put a bow on things. It was a relief then that there are plenty of opportunities for al fresco relaxation elsewhere at the hotel. Fairmont Dubai has two pool terraces, marked Sunrise and Sunset to ensure you get your vitamin D fix throughout the day. The latter is more of a convivial afternoon suntrap with a range of loungers, a bar and a comprehensive menu. On the roadside, the Sunrise pool (don’t let the name fool you) is more of a nightspot, for shisha, drinks and even some musical entertainment into the evening – if you’re partial to a bit of electric violin. The ninth floor outdoor area also serves as a reception for Noire, the hotel’s ‘dining in the dark’ experience, which seems fitting for a proper blind date, where you’re genuinely left in the dark about your dining partner as well as what’s on the plate. The three-course meal is a novelty, but well worth trying for an alternative night out with a friend or partner. The sensory deprivation really brings the flavours out of the food, as well as the discourse. Noire is one of 13 dining and entertainment venues; more than enough to keep you well-nourished during your stay. Another eatery of note is the renowned Exchange Grill, a modern steakhouse with all of the rubs, cuts and fillets you can possibly imagine. The restaurant is located on the Exchange Floor alongside the Cin Cin wine bar, boasting over 400 labels, and another cigar bar with its own walk-in humidor. Guilded guests will also relish the exclusive Gold-member lounge on the 33rd floor, whether it’s for breakfast, afternoon tea or happy hour cocktails. 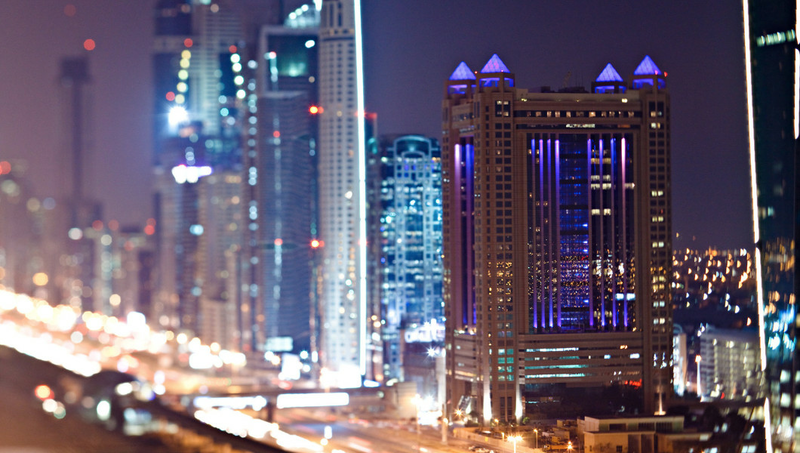 What it lacks in comparison to nearby resort hotels – namely a beachfront – Fairmont Dubai more than makes up for with its bustling location, adjacent to Dubai World Trade Centre and a host of other venues. While many of its guests will be in town for business, the hotel is a great venue to unwind, with the two pools, a great range of dining and The Spa at Fairmont Dubai; a 3,700 sqm facility with a Roman-esque Jacuzzi area and Turkish hammam-inspired steam rooms.